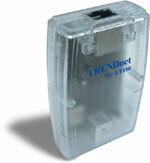 TRENDnet's TU-ET100 lets you experience a true Plug and Play network device easier than ever. 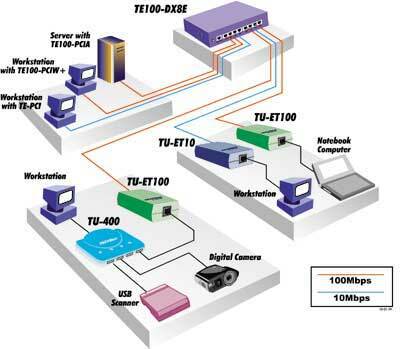 The USB network adapter allows you to connect any 10Mbps or 100Mbps network from a USB enabled PC, notebook, or USB hub. With instant hardware recognition from Windows 98 and "Hot Swap" feature from USB specification, operation is simple and easy. Simply hook up the USB cable at one end, plug a standard twisted pair (RJ-45) network cable in the other end, and you will be networked within seconds! Compatibility: The TU-ET100 is compatible with Windows 98/2000 to work as soon as it is plugged. Flexibility: The "Hot Swap" feature creates flexible connection and disconnection at any time. Expandability: Provides easy installation with Plug and Play feature. Speed: It is backed by a lifetime warranty for flawless performance.